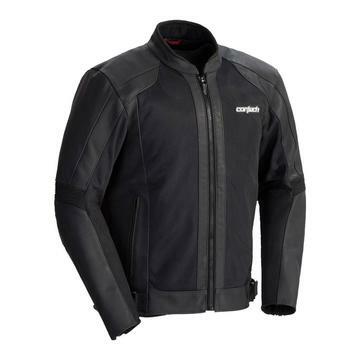 Unique jacket blending the toughness of leather with the venting of mesh fabric packaged in a sport cut design. • Shell constructed with top grade 1.2 - 1.4mm thick Monaco cowhide leather, and 300 denier tight-knit high-flow polyester mesh fabric. • FlexCor fabric built into the sleeves for a form fit. • 100g polyfill insulated zip-out vest liner for added warmth when needed. • Accordion stretch panels at the elbows and shoulder blades for added comfort extend the range of motion. • Microfiber-lined mandarin collar and snap-lock zippered cuffs for added comfort. • Zippered hand pockets, inside chest map pocket, inside mobile device, and pouch pocket for all the rider's storage needs. • Equipped with durable ESO™ zippers including a locking main zipper. • Adjustable waist belts for a comfort fit. • Reflective fabric on outside of arms and back help increase nighttime visibility. • Removable CE-approved level 2 armor in the elbows and shoulders, plus a CE-approved back protector. • Includes 8" jacket/pant zipper attachment with the pant side included.